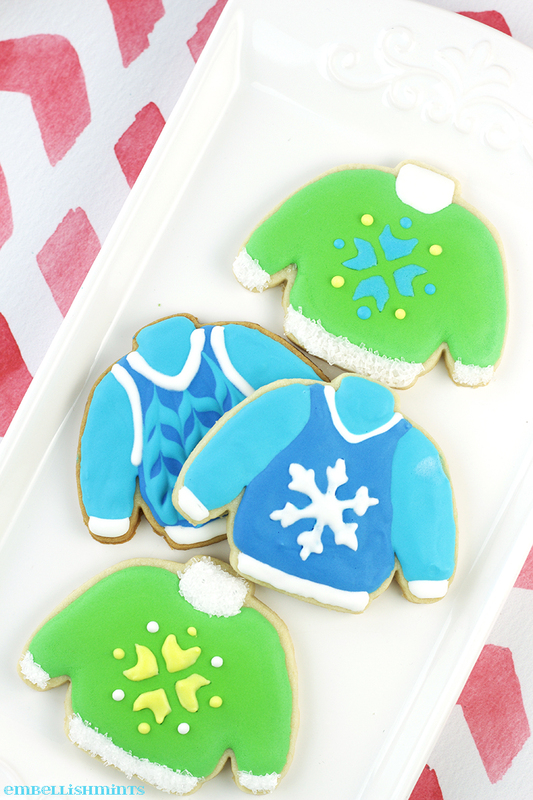 Ugly Christmas Sweaters are super fun to wear, but these Ugly Christmas Sweater Sugar Cookies are even more fun to make and eat! Christmas parties are always a fun time of year. Everyone shows up with lots of yummy appetizers to munch on and there’s usually a fabulous cocktail to get the party started. For me, festive holiday desserts are the best part for a Christmas party buffet. 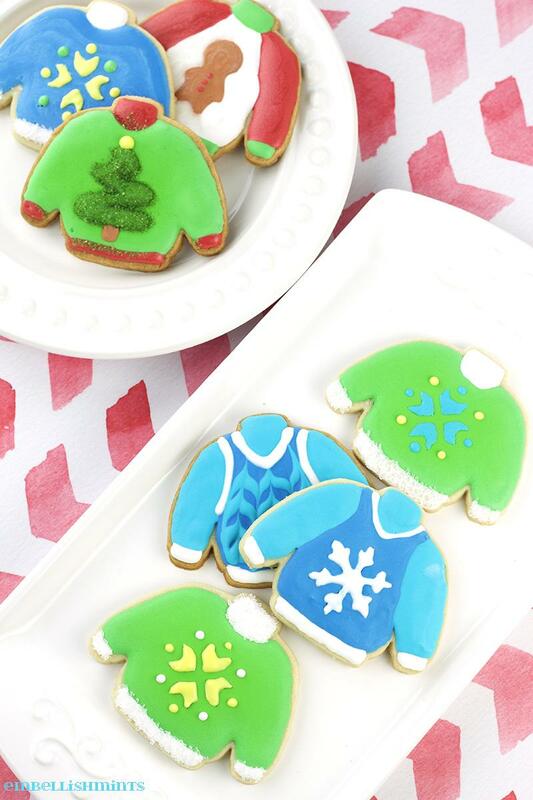 I love everything from Bourbon Fudge to Chocolate Nut Bars, but my new holiday dessert crush are these Ugly Christmas Sweater Sugar Cookies! They’re the perfect dessert to bring to Christmas cookie exchanges or an Ugly Christmas Sweater party! 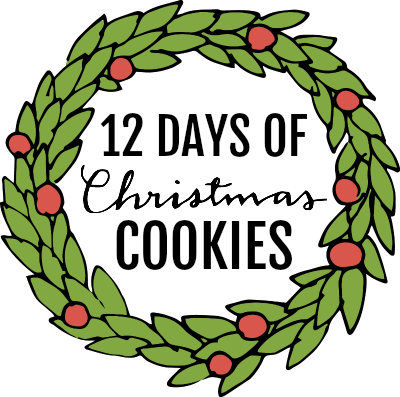 Hi, my name is Hilary and I blog over at Embellishmints. I am so excited to be here on Bread Booze Bacon with you! 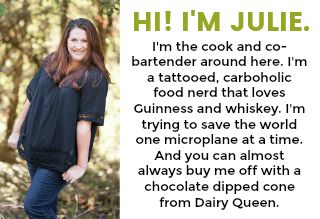 Julie truly is the queen of “damn good food” and I can’t believe I’m here to share a recipe with all of you. Me! Little old me. My tall, handsome husband and I live outside of Chicago with our three little boys. They are all boy, so at any given moment someone is begging for something to eat because they’re starving, a toy is being broken, or I’m being smothered in kisses. So I may have to work a little harder for the last one now that they’re getting older, but I cherish each kiss I get. While my boys love sports, dirt, and fighting (unfortunately) they also love to watch cookie decorating time-lapse videos with me. So being the fun mom I am I started making our own time-lapse videos we could watch together…while eating the cookies of course. You can check out all my Royal Icing Sugar Cookies videos here. They are seriously addicting to watch. I’m constantly adding more so be sure to check back often. With the holiday season in full swing, I can’t think of a better time to learn how to make these Ugly Christmas Sweater Cookies. Who doesn’t love a good Ugly Sweater?! Even if you know a scrooge who doesn’t like Christmas, I’m sure you can warm their heart with one of these cookies. While getting the ingredients I needed for these cookies I saw a lady filling up her cart with 50-pound bags of sugar and flour. I asked, out of curiosity, how she was going to store that much sugar and flour and I couldn’t believe her response. She said, “Oh we’re making Christmas cookies, so we won’t have much left over.” She must have a lot of friends and family because I can’t imagine going through that much sugar in a year, let alone one holiday season. Maybe I should be more friendly and make more friends! Luckily you won’t need 50 pounds of sugar to make these beauties! If you’re looking for more inspiration for your holiday party, you’ll love these Christmas Party Food Ideas for Kids. In a stand mixer (or a large bowl with a hand mixer), cream together butter and sugar. Mix until fluffy and well incorporated, about 1 minute. Add egg, salt, and extracts. Mix until combined. Add flour to the butter mixture in 3 additions, mixing until just combined after each addition. After the dough is all mixed it should be non-greasy to the touch. Separate the dough into two or three balls and chill in the fridge for at least 30 minutes. Divide royal icing into bowls and color as desired. Using a piping bag and #2 or #3 decorating tip, pipe sweater outline and fill in. 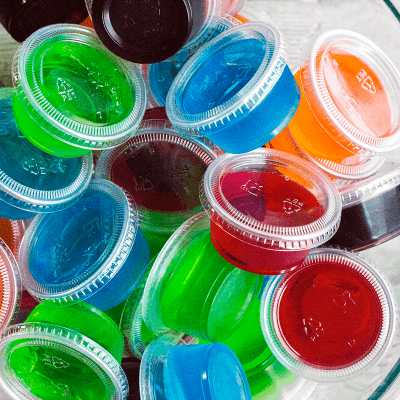 Allow icing to dry completely. Then pipe bottom hem of the sweater, sleeve cuffs, and neckline with a contrasting color. Sprinkle sanding sugar over the hem and cuffs. Allow to dry completely. Use a stencil, or free-hand draw, your decoration of choice on the center of the sweater. 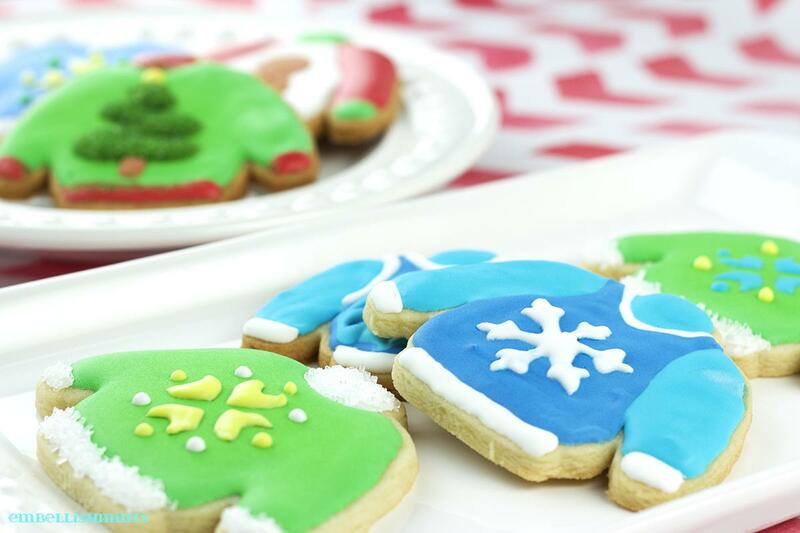 Gingerbread men, Christmas trees, snowflakes, and other 80's-esque designs are always a good choice.